If you live in Manchester and are looking for high quality quartz and granite worktops, you’ve come to the right place. Here at Mayfair Granite, we offer professional service on providing a kitchen worktop that’s right for you which is professionally installed at your home in Manchester. Everything went perfectly with the installation of my new granite worktops. The two fitters that came out were brilliant and you could tell that they took pride in their work, real perfectionists. We decided to bite the bullet and have our kitchen replaced, so we went to a local kitchen place. Who also quoted us for new granite worktops, but their price was very expensive. So we decided to look online and came across Mayfair Granite, who had a lot of positive reviews online and for good reason. There quote was very competitive compared to what we had received from our kitchen company. The service we received was unbelievable from start to finish, even when we had to move the templating date due to delays. Very understanding and could not do enough for us. The new granite worktops look marvellous; I have no hesitation in recommending them. 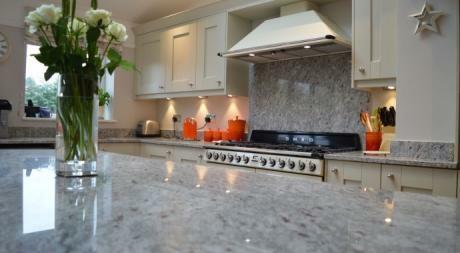 Our new granite worktops look fabulous and the price was competitive as well. An all round great deal, thank you Mayfair. Mayfair Granite in my opinion offers the best quality product and service available. They are really good value for money and deliver on what they promise, which in this day and age is rare. Mayfair Granite offers over 25 years of experience in dealing with quartz and granite and have grown to be one of the UK’s biggest suppliers to high end consumers, retail trade and food service industries. In maintaining a high standard on every area of work carried out, we are able to offer competitive prices and a fully personalised service to each of our customers in Manchester. Our highly skilled technicians and tradesman maintain a high level of standards to ensure our customers are satisfied 100% of the time. With our workshops based in the UK, we are able to provide an extremely quick turnaround between our templaters visiting your home and our installers fitting the worktops – this usually tends to be within a week at 5-7 days, ensuring you are not waiting for your quartz, and granite worktops to be installed. For all our worktops provided, we also provide a 10 year warranty for guaranteed piece of mind in your investment. So whether it’s a kitchen worktop or bathroom top, you have a strong reassurance in the quality of your product. If you’re looking to have quartz or granite worktops fitted in Manchester, contact us today on 0161 2416 849 for an up to date quote at a competitive price. Alternatively, feel free to use our online quotation form where you can acquire an instant quote on our website, for free!